The Australian Light Armoured Vehicle, ASLAV-25, is a wheeled, eight wheel drive (8x8), amphibious vehicle from the Diesel Division, General Motors (DDGM) of Canada. The one pictured above was under evaluation by the Australian Army for about three years. It must have done its stuff, because the design was adopted by the Australian Army. DDGM contracted British Aerospace Australia (BAeA) to fit-out and finish the ASLAV at its South Australia plant. This included air-conditioning and fitting the widest wheels and tyres to suit Australian conditions. Wheeled armoured vehicles are attractive compared to tracked vehicles because of their reliability, low maintenance costs and ability to transport themselves quickly over long distances. Propulsion in the water comes from two neatly mounted propellers, one each side. Top speed afloat is a handy 11kph. The turret is perfectly balanced so it can be traversed and the gun fired while in the water. There is a tiny rudder behind each propeller and it is hard to credit that these are large enough, although they are directly in the propeller flow. In fact the rudders gain considerable assistance from the front four steering road wheels. 2012: "The last two Australian Light Armoured Vehicles (ASLAVs) serving in the Middle East Area of Operations (MEAO) completed their tour of duty with a range shoot at the Multi National Base - Tarin Kot [Afghanistan] heavy weapons range in November." -- defense. 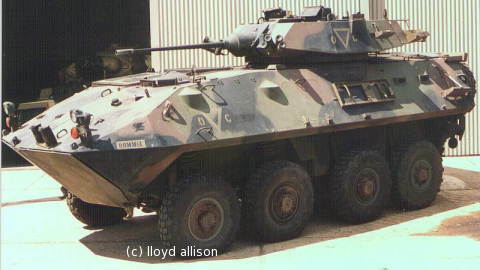 2018 March 14: The Australian Government selected the 'Boxer CRV' by Rheinmetall (.de) to replace the ASLAV.